Jeganee Technologies has the specialist expertise to deliver industry-focused Industry 4.0 implementations for customers in a variety of sectors. Get in touch about implementing Industry 4.0. INDUSTRY 4.0 - It is a name for the current trend of automation and data exchange in manufacturing technologies. It includes cyber-physical systems, the Internet of things, cloud computing and cognitive computing. Industry 4.0 is more than just a flashy catchphrase. A confluence of trends and technologies promises to reshape the way things are made. Merging the real world and cyberspace, huge volumes of data forming the basis for accurate production decisions, companies growing together digitally, products and production in digital dialogue: that’s Industry 4.0, also referred to as the fourth industrial revolution, and similarly momentous today as the steam engine was 250 years ago. To capture the potential, manufacturers can consider three moves. Primarily, companies can gather more information and make better use of it. An oil-exploration company collected more than 30,000 pieces of data from each of its drilling rigs—yet 99 percent of that data was lost due to problems of data transmission, storage, and architecture. The executives we surveyed said that correcting these data inefficiencies should improve productivity by about 25 percent. With production data now available for the asking, executives rightly wonder about how to begin. Which data would be most beneficial? Which data leakages are causing the most pain? Which technologies would deliver the biggest return on investment for a company, given its unique circumstances? 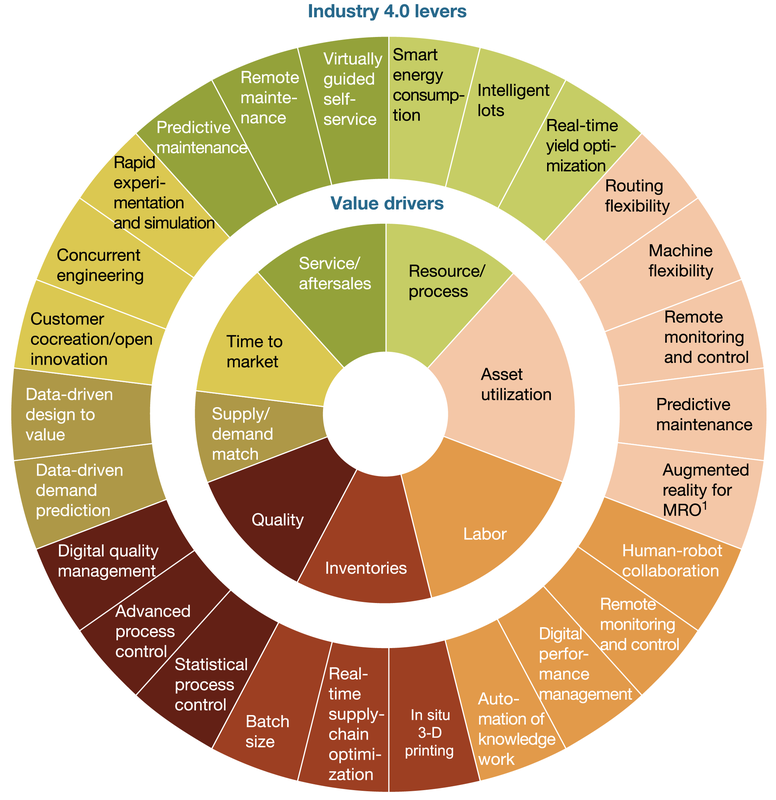 To sort through the choices, manufacturing leaders can use a “digital compass” (exhibit). The compass consists of eight basic value drivers and 26 practical Industry 4.0 levers. Cross-functional discussions that will help companies find the levers that are best suited to solve their particular problems. Understand the strengths and weaknesses of a company in the digital field, and set targets for next five years. Realize which systems your company can build on, and transition to digital technology in a measured way, evaluating the benefits and costs of the transition. Top company stakeholders can be convinced by providing clear numbers and a transition business plan. 2. Select the right team and the right digital tools. Our company having potential calibered employees with the right digital skills, and company’s success in Industry 4.0 knowledge. We having user interface designers and digital innovation managers. Practicing automated document and process management systems that provide on-site training will allow to cut hiring expenses. For example, DocLogix provides on-site implementation and staff training. 3. Focus on improving processes. Focusing on end-to-end process perspective will increase collaboration and simplify how the company functions. Invest on process automation, including information related processes. Development in an agile IT function that can respond flexibly to business demand and help to continuously improve services. Our industry 4.0 offers a wide list of ready-to-use solutions, dedicated to performing easy, traceable and automated management of a manufacturing company. Our industry 4.0 platform serves as a bridge between management and production teams, enabling all information about the manufacturing and business processes to be available when it is needed and where it is needed. All employees, starting from CEO, down to production and sales managers are benefiting from increased accountability and traceability, reduced paper workload, and overall performance. Our industry 4.0 system is accessible remotely, from anywhere, and accurately shows who is working on which projects, which tasks are lagging behind and what needs more input from managers. 6. Appoint a person or a team to lead the digital transformation. A company can transition to digital environment only with committed leadership. There should be an executive appointed to lead the digital transformation or some kind of a digital council that manages the integration of new digital products, platforms and services. Analyze our consumer, and we will understand that customer's needs speed, flexibility and customization from their products. Only a fully automated manufacturing company can meet all these needs.